Easily import reviewer contact information directly from reports or spreadsheets, including from other projects or sales databases. TextReviews provides you with several mechanisms for building up a list of potential reviewers for a review. 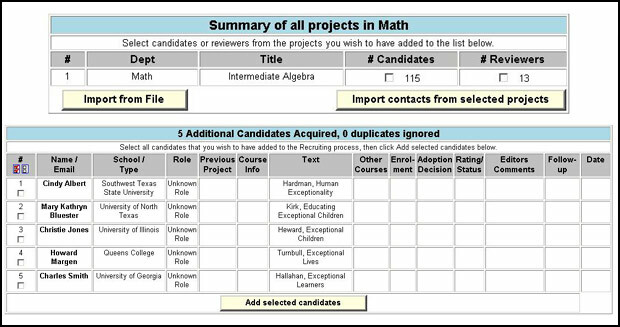 You can import lists from other projects (either reviewers or the recruiting candidates), you can read reports or spreadsheets from your sales database or other mailing lists, or you can enter candidates directly. Regardless of the method used, all names are available for the recruiting system. You can sort the list, filter the names, and then select the candidates you wish to contact.